Here is a preview of part of the chart I made for my preschoolers. There is a morning responsibility section and an evening. Today marks my first day back to work after summer break and the first day of Owen’s 3rd round of chemotherapy. I’m praying it will not be as stressful of a week as I imagine it will be. One thing Owen and I had been trying to do this weekend was getting prepared. That means stocking the fridge full of foods Owen can stomach and can make on his own without me there. It means getting the house clean so we don’t have to be cleaning during the week too much other than picking up after ourselves. It means getting a meal calendar out for anyone who wants to help bring us a meal and prepare some meals and snacks for me to eat as well. The less I’m making food, the more I can help Owen and spend time with the kids after work. What I’m most excited about is that we FINALLY got some responsibility charts up in our hallway for our kids. Part of the stress during the work week is that we are not consistent with making sure the kids clean up after themselves or do what they need to do without us having to remember it for them. 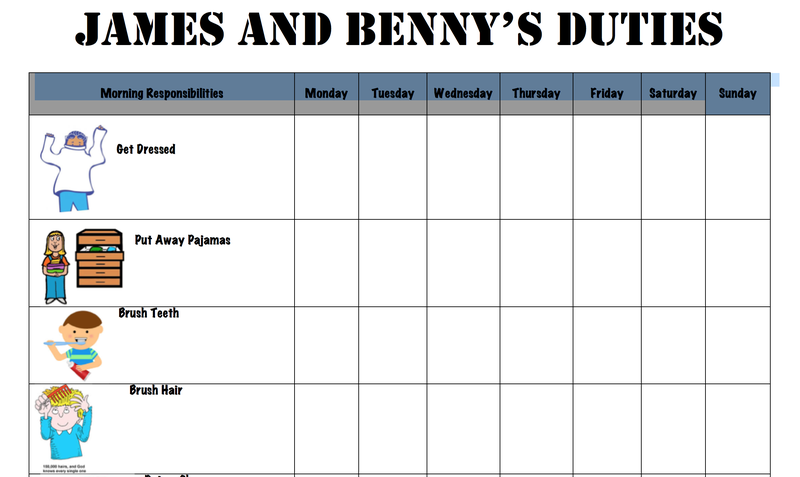 I made one for my 8-year-old son, which includes routine tasks, and also a daily chore, and that sort of thing. My preschooler boys have a slightly different one–it includes pictures because they can’t read yet. James can read some words like cat and dog, etc…but not “put dirty clothes in the hamper.” Next to the picture though, I do write the direction as well. Yesterday we had a practice day and James thrived off of it. I loved it because I didn’t have to tell him what to do. He just looked at his chart and followed the order. Next thing I knew it was 20 minutes till we had to leave and he had already gotten dressed, put his jammies away, brushed his teeth and his hair, put on his shoes and socks, and was now able to eat his breakfast. Last night we went through the evening duties with him. They are a bit more than just routine as they include cleaning up their room and any toys left in the living room. But he just loved it. Benny still had to be told what to do next as he wasn’t eager to go up to the chart and read what’s next himself. He’s a bit more of a free spirit and definitely the baby of the boys. But at least I had James helping out and the chart there to keep me consistent too. For example– when I get home, I’m thinking about all the things I need to get done. I am not thinking about making sure the boys take off their shoes and put them in the shoe bucket. So the next day when James can’t find his shoes, I am very stressed out. We find them in all sorts of places because he just takes them off when ever he has the desire and leaves them at that location. One shoe will be under the bed and the other sometimes outside. Its ridiculous. And annoying. Even infuriating at times. But today when I went to the chart, I asked if he put his shoes in the shoe bucket, and sure enough, he had because he followed his chart.